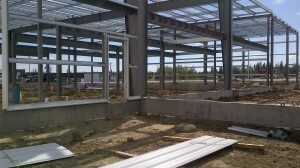 All of the Steel Building Systems used for our building structures are provided by Behlen Industries. BEHLEN Industries LP was the first North American steel building manufacturer registered to ISO 9001. In addition to ISO, they are certified to CSA standard A660, the Canadian standard for Steel Building Systems. Atkinson Construction is very proud to be working with Behlen and we are confident that our projects will achieve a high standard of quality and care.